Ricky Hatton has relinquished the WBA welterweight title he claimed from Luis Collazo in May. 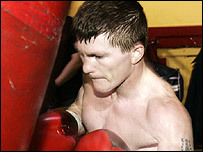 Hatton now has the chance to fight Jose Luis Castillo in a light-welterweight bout planned for early next year. Before that, the Manchester fighter will be looking to win back his IBF crown from Juan Urango on 6 January. "We're after Ricky's old title. But the defining fight we want is the one against Castillo," said Hatton's promoter Dennis Hobson. Hobson added: "We have already opened talks with Castillo's promoter Bob Arum and we are confident we can make that fight for around April time. Ricky is in a very lucrative position at the moment." Hatton gave up his IBF light-welterweight title in April, which he won by beating Kostya Tszyu, in order to move up a division. The 27-year-old is expected to win back his old crown and set up a potentially lucrative contest against Castillo.